A glacier is a large, slow-moving river of ice formed from compacted and crystallized layers of snow. A glacier slowly deforms and flows in response to gravity. Glacier ice is the largest reservoir of fresh water on Earth, and second only to oceans as the largest reservoir of total water. Glaciers cover vast areas of the polar regions but in the tropics are restricted to the highest mountains. Elsewhere in the solar system, the vast polar ice caps of Mars rival those of the Earth. Geologic features created by glaciers include end, lateral, ground and medial moraines that form from glacially transported rocks and debris; U-shaped valleys and cirques at their heads; and the glacier fringe, which is the area where the glacier has recently melted into water. The word glacier comes from French via the Vulgar Latin glacia, and ultimately from Latin glacies meaning ice. Mouth of the Schlatenkees Glacier near Innergschlöß, Austria. There are two main types of glaciers: alpine glaciers, which are found in mountain terrains, and continental glaciers, which can cover larger areas. Most of the concepts in this article apply equally to alpine glaciers and continental glaciers. Below its top 10-20 meters (33-66 feet), a temperate glacier is at the pressure melting point of ice throughout the year, which permits the glacier to deform in response to gravitational force. (Note: Pressure on ice reduces its melting temperature, because water is more dense than ice). The ice of polar glaciers is always below the freezing point, so most of their mass loss is due to sublimation. Sub-polar glaciers have a seasonal zone of melting near the surface and have some internal drainage, but little to no basal melt. Because thermal classifications of glacier surface conditions can be quite varied, a framework of glacier melt zones is often used to identify melt conditions. The dry snow zone is a region where no melt occurs, even in the summer. The percolation zone is an area with some surface melt, and meltwater percolating into the snowpack, often this zone is marked by refrozen ice lenses, glands, and layers. The wet snow zone is the region where all of the snow deposited since the end of the previous summer has been raised to 0 °C. The superimposed ice zone is the region within the glacier at which meltwater percolating downward encounters a cold layer in the glacier that refreezes the meltwater in the form of a continuous mass of ice. The smallest alpine glaciers form in mountain valleys and are referred to as valley glaciers. Larger glaciers can cover an entire mountain, mountain chain or even a volcano; this type is known as an ice cap. Ice caps feed outlet glaciers, tongues of ice that extend into valleys below, far from the margins of those larger ice masses. Outlet glaciers are formed by the movement of ice from a polar ice cap, or an ice cap from mountainous regions, to the sea. The largest glaciers are continental ice sheets, enormous masses of ice that not visibly affected by the landscape and covering the entire surface beneath them, except possibly on the margins where they are thinnest. Antarctica and Greenland are the only places where continental ice sheets currently exist. These regions contain vast quantities of fresh water. The volume of ice is so large that if the Greenland ice sheet melted, it would cause sea levels to rise some six meters (20 feet) all around the world. If the Antarctic ice sheet melted, sea levels would rise up to 65 meters (210 feet). Plateau glaciers resemble ice sheets, but on a smaller scale. They cover some plateaus and high-altitude areas. This type of glacier appears in many places, especially in Iceland and some of the large islands in the Arctic Ocean, and throughout the northern Pacific Cordillera from southern British Columbia to western Alaska. Tidewater glaciers are alpine glaciers that flow into the sea. As the ice reaches the sea, pieces break off, or calve, forming icebergs. Most tidewater glaciers calve above sea level, which often results in a tremendous splash as the iceberg strikes the water. If the water is deep, glaciers can calve underwater, causing the iceberg to suddenly explode up out of the water. The Hubbard Glacier is the longest tidewater glacier in Alaska and has a calving face over ten kilometers long. Yakutat Bay and Glacier Bay are both popular with cruise ship passengers because of the huge glaciers descending hundreds of feet to the water. Low and high contrast images of the Byrd Glacier. The low-contrast version is similar to the level of detail the naked eye would see — smooth and almost featureless. The bottom image uses enhanced contrast to highlight flow lines on the ice sheet and bottom crevasses. The snow that forms temperate glaciers is subject to repeated freezing and thawing, which changes it into a form of granular ice called névé. As more layers of ice and snow accumulate, the growing pressure on the névé causes this granular ice to fuse into denser firn. Over a period of years, layers of firn undergo further compaction and become glacial ice. In addition, a few hours after deposition, snow will begin to undergo metamorphism because of the presence of temperature gradients and/or convex and concave surfaces within individual crystals (causing differential vapor pressure). This causes the sublimation of ice from smaller crystals and the deposition of water vapor onto larger crystals, causing many crystals to become progressively more rounded over time. Depending on the type of metamorphism, the snowpack may become stronger or weaker as a result. 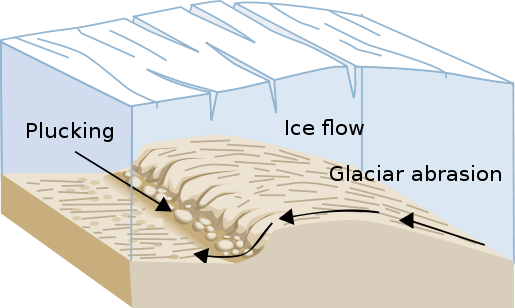 The lower layers of glacial ice flow and deform plastically under the pressure, allowing the glacier as a whole to move slowly like a viscous fluid. Glaciers usually flow downslope, although they do not need a surface slope to flow, as they can be driven by the continuing accumulation of new snow at their source, creating thicker ice and a surface slope. The upper layers of glaciers are more brittle, and often form deep cracks known as crevasses or bergschrunds as they move. Crevasses form due to internal differences in glacier velocity between two quasi-rigid parts above the deeper more plastic substrate far below. As the parts move at different speeds and directions, shear forces cause the two sections to break apart opening the crack of a crevasse all along the disconnecting faces. Projected in effect over three dimensions, one crack may settle and tip, the other upthrust or twist, or all such combinations due to the effects of each floating on the plastic layers below and any contact with rock and such. Hence the distance between the two separated parts while touching and rubbing deep down, frequently widens significantly towards the surface layers, many times creating a wide chasm. These crevasses make travel over glaciers hazardous. Subsequent heavy snow may form a fragile snow bridge, increasing the danger by hiding their presence at the surface. Glacial meltwaters flow throughout and underneath glaciers, carving channels in the ice (called moulins) similar to cave formation through rock and also helping to lubricate the glacier's movement. The higher altitude part of a glacier that receives most of the snowfall is called the accumulation zone. In general, the accumulation zone accounts for 60-70 percent of the glacier's surface area. The depth of ice in the accumulation zone exerts a downward force sufficient to cause deep erosion of the rock in this area. After the glacier is gone, this often leaves a bowl or amphitheater-shaped isostatic depression called a cirque. On the opposite end of the glacier, at its foot or terminal, is the deposition or ablation zone, where more ice is lost through melting than gained from snowfall and sediment is deposited. The place where the glacier thins to nothing is called the ice front. The altitude where the two zones meet is called the equilibrium line, also called the snow line. At this altitude, the amount of new snow gained by accumulation is equal to the amount of ice lost through ablation. Due to erosive forces at the edges of the moving ice, glaciers turn V-shaped river-carved valleys into U-shaped glacial valleys. The "health" of a glacier is defined by the area of the accumulation zone compared to the ablation zone. When directly measured this is glacier mass balance. Healthy glaciers have large accumulation zones. Several non-linear relationships define the relation between accumulation and ablation. Permanent snow cover is affected by factors such as the degree of slope on the land, amount of snowfall and the force and nature of the winds. As temperature decreases with altitude, high mountains—even those near the Equator—have permanent snow cover on their upper portions, above the snow line. Examples include Mount Kilimanjaro in Tanzania and the Tropical Andes in South America; however, the only snow to occur exactly on the Equator is at 4,690 m (15,387 ft) on the southern slope of Volcán Cayambe in Ecuador. Conversely, many regions of the Arctic and Antarctic receive very little precipitation and therefore experience little snowfall despite the bitter cold (cold air, unlike warm air, cannot take away much water vapor from the sea). In Antarctica, the snow does not melt even at sea level. In addition to the dry, unglaciated regions of the Arctic, there are some mountains and volcanoes in Bolivia, Chile and Argentina that are high (4,500 m (14,800 ft) - 6,900 m (22,600 ft)) and cold, but the relative lack of precipitation prevents snow from accumulating into glaciers. This is because these peaks are located near or in the hyperarid Atacama desert. Further examples of these temperate unglaciated mountains is the Kunlun Mountains, Tibet and the Pamir Range to the north of the Himalayas in Central Asia. Here, just like the Andes, mountains in Central Asia can reach above 6,000 m (20,000 ft) and be barren of snow and ice due to the rain shadow effect caused by the taller Himalaya Range. During glacial periods of the Quaternary, most of Siberia, central and northern Alaska and all of Manchuria, were similarly too dry to support glaciers, though temperatures were as low as or lower than in glaciated areas of Europe and North America. This was because dry westerly winds from ice sheets in Europe and the coastal ranges in North America reduced precipitation to such an extent that glaciers could never develop except on a few high mountains like the Verkhoyansk Range (which still supports glaciers today). Glaciers occur on every continent and in approximately 47 of the world's countries. Though Australia has no glaciers, New Guinea is considered to be part of the Australian continent and small glaciers are located on its highest summit massif of Puncak Jaya. Africa has glaciers on Mount Kilimanjaro, Mount Kenya and in the Ruwenzori Range. Ice behaves like an easily breaking solid until its thickness exceeds about 50 meters (160 ft). The pressure on ice deeper than that depth causes plastic flow. The glacial ice is made up of layers of molecules stacked on top of each other, with relatively weak bonds between the layers. When the stress of the layer above exceeds the inter-layer binding strength, it may move faster than the layer below. Another type of movement is basal sliding. In this process, the whole glacier moves over the terrain on which it sits, lubricated by meltwater. As the pressure increases toward the base of the glacier, the melting point of ice decreases, and the ice melts. Friction between ice and rock and geothermal heat from the Earth's interior also contribute to thawing. This type of movement is dominant in temperate glaciers. The geothermal heat flux becomes more important the thicker a glacier becomes. The top 50 meters of the glacier are more rigid. In this section, known as the fracture zone, the ice mostly moves as a single unit. Ice in the fracture zone moves over the top of the lower section. When the glacier moves through irregular terrain, cracks form in the fracture zone. These cracks can be up to 50 meters deep, at which point they meet the plastic like flow underneath that seals them. Cracks make glaciers a dangerous place to visit, because they are not always easy to spot. The speed of glacial displacement is partly determined by friction. which makes the ice at the bottom of the glacier move slower than the upper portion. In alpine glaciers, friction generated at the valley's side walls also slows the edges relative to the center. This was confirmed by experiments in the Nineteenth century, in which stakes were planted in a line across an alpine glacier, and as time passed, those in the center moved farther. Mean speeds vary; some have speeds so slow that trees can establish themselves among the deposited scourings. In other cases they can move as fast as many meters per day, as is the case of Byrd Glacier, an outlet glacier in Antarctica which moves 750-800 meters per year (some two meters or six feet per day), according to studies using satellites. Many glaciers have periods of very rapid advancement called surges. These glaciers exhibit normal movement until suddenly they accelerate, then return to their previous state. During these surges, the glacier may reach velocities up to 100 times greater than normal. Glacial moraines are formed by the deposition of material from a glacier and are exposed after the glacier has retreated. These features usually appear as linear mounds of till, a non-sorted mixture of rock, gravel and boulders within a matrix of a fine powdery material. Terminal or end moraines are formed at the foot or terminal end of a glacier. Lateral moraines are formed on the sides of the glacier. Medial moraines are formed when two different glaciers, flowing in the same direction, coalesce and the lateral moraines of each combine to form a moraine in the middle of the merged glacier. Less apparent is the ground moraine, also called glacial drift, which often blankets the surface underneath much of the glacier downslope from the equilibrium line. Glacial meltwaters contain rock flour, an extremely fine powder ground from the underlying rock by the glacier's movement. 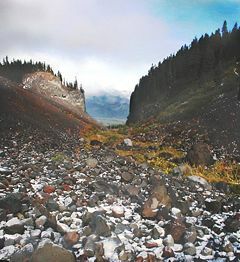 Other features formed by glacial deposition include long snake-like ridges formed by streambeds under glaciers, known as eskers, and distinctive streamlined hills, known as drumlins. Stoss-and-lee erosional features are formed by glaciers and show the direction of their movement. Long linear rock scratches (that follow the glacier's direction of movement) are called glacial striations, and divots in the rock are called chatter marks. Both of these features are left on the surfaces of stationary rock that were once under a glacier and were formed when loose rocks and boulders in the ice were transported over the rock surface. Transport of fine-grained material within a glacier can smooth or polish the surface of rocks, leading to glacial polish. Glacial erratics are rounded boulders that were left by a melting glacier and are often seen perched precariously on exposed rock faces after glacial retreat. The term moraine is of French origin; it was coined by peasants to describe alluvial embankments and rims found near the margins of glaciers in the French Alps. Currently, the term is used more broadly, and is applied to a series of formations, all of which are composed of till. A drumlin field forms after a glacier has modified the landscape. The teardrop-shaped formations denote the direction of the ice flow. Drumlins are asymmetrical, canoe shaped hills with aerodynamic profiles made mainly of till. Their heights vary from 15 to 50 meters and they can reach a kilometer in length. The tilted end of the hill looks toward the direction from which the ice advanced (stoss), while the longer slope running toward the other end follows the ice's direction of movement (lee). Drumlins are found in groups called drumlin fields or drumlin camps. An example of these fields is found east of Rochester, New York, and it is estimated that it contains about 10,000 drumlins. Although the process that forms drumlins is not fully understood, it can be inferred from their shape that they are products of the plastic deformation zone of ancient glaciers. It is believed that many drumlins were formed when glaciers advanced over and altered the deposits of earlier glaciers. Rocks and sediments are added to glaciers through various processes. Glaciers erode the terrain principally through two methods: abrasion and plucking. As the glacier flows over the bedrock's fractured surface, it loosens and lifts blocks of rock that are brought into the ice. This process, known as plucking, occurs through cycles in which subglacial water penetrates fractures in the bedrock and the subsequent freezing expansion separates blocks of rock from the bedrock. When the water expands, it acts as a lever that loosens the rock by lifting it. In this way, sediments of all sizes become part of the glacier's load. Abrasion occurs when the ice and the load of rock fragments slide over the bedrock and function as sandpaper that smooths and polishes the surface below, while simultaneously producing pulverized rock, which is called rock flour. This flour is formed by rock grains of a size between 0.002 and 0.00625 mm. Sometimes the amount of rock flour produced is so high that currents of meltwaters acquire a grayish color. Another of the visible characteristics of glacial erosion are glacial striations, which are produced when the bottom's ice contains large chunks of rock that gouge trenches in the bedrock. By mapping the direction of the flutes the direction of the glacier's movement can be determined. Chatter marks are seen as lines of roughly crescent shape depressions in the rock underlying a glacier caused by the abrasion where a boulder in the ice catches and is then released repetitively as the glacier drags it over the underlying basal rock. A glacier may also erode its environment through katabatic winds. Relative ease of erosion of the surface under the glacier. Thermal conditions at the glacier base. Permeability and water pressure at the glacier base. Fluvial and outwash: sediments deposited by water. These deposits are stratified through various processes, such as boulders being separated from finer particles. The larger pieces of rock which are encrusted in till or deposited on the surface are called glacial erratics. They may range in size from pebbles to boulders, but as they may be moved great distances they may be of drastically different type than the material upon which they are found. Patterns of glacial erratics provide clues of past glacial motions. A glaciated valley in the Mount Hood Wilderness showing the characteristic U-shape and flat bottom. This image shows the termini of the glaciers in the Bhutan Himalaya. Glacial lakes have been rapidly forming on the surface of the debris-covered glaciers in this region during the last few decades. Before glaciation, mountain valleys have a characteristic "V" shape, produced by downward erosion by water. However, during glaciation, these valleys widen and deepen, which creates a "U"-shaped glacial valley. 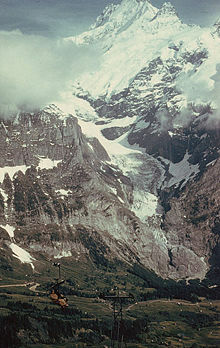 Besides the deepening and widening of the valley, the glacier also smooths it through erosion. 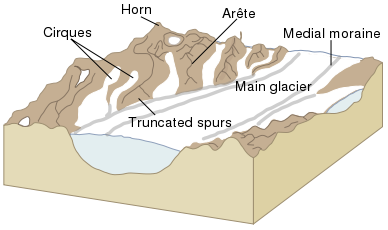 In this way, glaciers can eliminate the spurs of earth that extend across the valley leaving at the edges triangular cliffs called truncated spurs. Many glaciers deepen their valleys more than their smaller tributaries. Therefore, when the glaciers recede from the region, the valleys of the tributary glaciers remain above the main glacier's depression, and these are called hanging valleys. In parts of the soil that were affected by abrasion and plucking, the depressions left can be filled by lakes, called paternoster lakes. There may be two glacial cirques 'back to back' which erode deep into their backwalls until only a narrow ridge, called an arête is left. This structure may result in a mountain pass. Glaciers are also responsible for the creation of fjords (deep coves or inlets) and escarpments that are found at high latitudes. An arête is a narrow crest with a sharp edge. The meeting of three or more arêtes creates pointed pyramidal peaks and in extremely steep-sided forms these are called horns. Both features may have the same process behind their formation: the enlargement of cirques from glacial plucking and the action of the ice. Horns are formed by cirques that encircle a single mountain. Arêtes emerge in a similar manner; the only difference is that the cirques are not located in a circle, but rather on opposite sides along a divide. Arêtes can also be produced by the collision of two parallel glaciers. In this case, the glacial tongues cut the divides down to size through erosion, and polish the adjacent valleys. Some rock formations in the path of a glacier are sculpted into small hills with a shape known as roche moutonnée or sheepback. An elongated, rounded, asymmetrical, bedrock knob can be produced by glacier erosion. It has a gentle slope on its up-glacier side and a steep to vertical face on the down-glacier side. 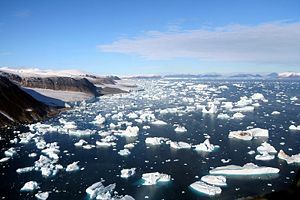 The glacier abrades the smooth slope that it flows along, while rock is torn loose from the downstream side and carried away in ice, a process known as "plucking." Rock on this side is fractured by combinations of forces due to water, ice in rock cracks, and structural stresses. The water that rises from the ablation zone moves away from the glacier and carries with it fine eroded sediments. As the speed of the water decreases, so does its capacity to carry objects in suspension. The water then gradually deposits the sediment as it runs, creating an alluvial plain. When this phenomenon occurs in a valley, it is called a valley train. When the deposition is to an estuary, the sediments are known as "bay mud." Alluvial plains and valley trains are usually accompanied by basins known as kettles. Glacial depressions are also produced in till deposits. These depressions are formed when large ice blocks are stuck in the glacial alluvium and after melting, they leave holes in the sediment. Generally, the diameter of these depressions does not exceed two km, except in Minnesota, where some depressions reach up to 50 km in diameter, with depths varying between 10 and 50 meters. When a glacier reduces in size to a critical point, its flow stops, and the ice becomes stationary. Meanwhile, meltwater flowing over, within, and beneath the ice leaves stratified alluvial deposits. Because of this, as the ice melts, it leaves behind stratified deposits in the form of columns, terraces and clusters. These types of deposits are known as deposits in contact with ice. When those deposits take the form of columns of tipped sides or mounds, they are called kames. Some kames form when meltwater deposits sediments through openings in the interior of the ice. In other cases, they are just the result of fans or deltas toward the exterior of the ice produced by meltwater. When the glacial ice occupies a valley it can form terraces or kames along the sides of the valley. A third type of deposit formed in contact with the ice is characterized by long, narrow sinuous crests composed fundamentally of sand and gravel deposited by streams of meltwater flowing within, beneath or on the glacier ice. After the ice has melted these linear ridges or eskers remain as landscape features. Some of these crests have heights exceeding 100 meters (328 feet) and their lengths surpass 100 km (60 miles). Very fine glacial sediment or rock flour is often picked up by wind blowing over the bare surface and may be deposited great distances from the original fluvial deposition site. These eolian loess deposits may be very deep, even hundreds of meters, as in areas of China and the Midwestern United States. Isostatic rebound is a rise of a part of the crust due to an isostatic adjustment after a glacier recedes. A large mass, such as an ice sheet/glacier, depresses the crust of the Earth and displaces the mantle below. The depression is about a third the thickness of the ice sheet. After the glacier melts the mantle begins to flow back to its original position pushing the crust back to its original position. This post-glacial rebound, which lags melting of the ice sheet/glacier, is currently occurring in measurable amounts in Scandinavia and the Great Lakes region of North America. An interesting geomorphological feature created by the same process, but on a smaller scale, is known as dilation-faulting. It occurs within previously compressed rock that is allowed to return to its original shape, but more rapidly than can be maintained without faulting, leading to an effect similar to that which would be seen if the rock were hit by a large hammer. This can be observed in recently de-glaciated parts of Iceland. A quadruple division of the Quaternary glacial period has been established for North America and Europe. These divisions are based principally on the study of glacial deposits. In North America, each of these four stages was named for the state in which the deposits of these stages were well exposed. In order of appearance, they are the following: Nebraskan, Kansan, Illinoisan, and Wisconsinan. This classification was refined thanks to the detailed study of the sediments of the ocean floor. Because the sediments of the ocean floor are less affected by stratigraphic discontinuities than those on land, they are useful to determine the climatic cycles of the planet. In this matter, geologists have come to identify over 20 divisions, each of them lasting approximately 100,000 years. All these cycles fall within the Quaternary glacial period. During its peak, the ice left its mark over almost 30 percent of Earth's surface, covering approximately 10 million km² (3.86 million mile²) in North America, five million km² (1.93 million mile²) in Europe and four million km² (1.54 million mile²) in Asia. The glacial ice in the Northern hemisphere was double that found in the Southern hemisphere. This is because southern polar ice cannot advance beyond the Antarctic landmass. The last major glacial period began about two million years B.P. and is commonly known as the Pleistocene or Ice Age. During this glacial period, large glacial ice sheets covered much of North America, Europe, and Asia for long periods of time. The extent of the glacier ice during the Pleistocene, however, was not static. The Pleistocene had periods when the glaciers retreated (interglacial) because of mild temperatures, and advanced because of colder temperatures (glacial). Average global temperatures at the peak of the Pleistocene epoch were probably four to five degrees Celsius colder than they are today. The most recent glacial retreat began about 14,000 years B.P. and is still going on. We call this period the Holocene epoch. Generalized glaciations have been rare in the history of Earth. However, the Ice Age of the Pleistocene was not the only glacial event, as is shown be the occurrence tillite deposits. Tillite is a sedimentary rock formed when glacial till is lithified, or turned into solid rock through pressure over a long period of time. These deposits found in strata of differing ages present similar characteristics as fragments of fluted rock, and some are superposed over bedrock surfaces of channeled and polished rock or associated with sandstone and conglomerates that have features of alluvial plain deposits. Two Precambrian glacial episodes have been identified, the first approximately two billion years ago, and the second (Snowball Earth) about 650 million years ago. Also, a well documented record of glaciation exists in rocks of the late Paleozoic (the Carboniferous and Permian). Although there are several scientific hypotheses about the determining factors of glaciations, the two most important ideas are plate tectonics and variations in Earth's orbit (Milankovitch cycles). Given that glaciers can form only on dry land, the theory of plate tectonics suggests that the evidence of previous glaciations found on land masses currently in tropical latitudes due to the drift of tectonic plates from circumpolar regions into the tropical latitudes. Evidence of glacial structures in South America, Africa, Australia, and India support this idea, because it is known that they experienced a glacial period near the end of the Paleozoic Era, some 250 million years ago. The idea that the evidence of middle-latitude glaciations is closely related to the displacement of tectonic plates was confirmed by the absence of glacial traces in the same period for the higher latitudes of North America and Eurasia, which indicates that their locations also were very different from today. Climatic patterns are also related to the positions of the continents, which has meant that climate patterns have changed as the plates have been displaced. Closely interconnected with climate and the position of the continents are the ocean current patterns, which have a great contribution to heat transmission and humidity. Since continents drift very slowly (about two cm per year), these complex changes occur in periods of millions of years. A study of marine sediment that contained climatically sensitive microorganisms until about half a million years ago was compared with studies of the geometry of Earth's orbit, and the result was clear: climatic changes are closely related to periods of obliquity, precession, and eccentricity of the Earth's orbit. The movement of the tectonic plates and the recurring patterns of variation in earth's orbital relation with the sun are both primary factors affecting climate and thus contributing to the cycles of glaciation. Plate tectonics applies to long time periods ad determines the foundations of the climate system upon which the orbital variations superimpose such periodic alterations as those of the glacial periods of the Pleistocene. In both mechanisms the radiation imbalance of the earth is thought to play a large role in the build-up and melt of glaciers. ↑ D.P. Simpson, 1979. Cassell's Latin Dictionary. (London, UK: Cassell Ltd. ISBN 0304522570). ↑ Web Exhibits.org Institute for Dynamic Educational Advancement (IDEA) "Ice and Snow".Retrieved November 18, 2007. ↑ Climate Change 2001: Working Group I: The Scientific Basis Intergovernmental Panel on Climate Change.Retrieved November 18, 2007. ↑ John BiggarWorld Snow, Glacier & Resort IndexPiste-off.com List of Countries with glaciers. Retrieved September 7, 2007. ↑ Glaciology Group & Oxford University, Mathematical Institute. 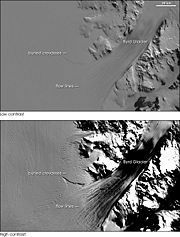 "Calibration and refinement of glacier surge models" Retrieved November 18, 2007. Benn, Douglas I. 1998. Glaciers and Glaciation. London, UK: Hodder Arnold. ISBN 0340584319. Bennett, M.R. and N.F. Glasser. 1996. Glacial Geology: Ice Sheets and Landforms. Hoboken, NJ: John Wiley & Sons. ISBN 0471963453. Hambrey, Michael. 1994. Glacial Environments. Vancouver, BC: University of British Columbia Press. ISBN 0774805102. Hambrey, Michael and Jürg Alean. 2004. Glaciers. Cambridge: Cambridge University Press. ISBN 0521828082. Knight, Peter G. 1999. Glaciers. Cheltenham, UK: Nelson Thornes. ISBN 0748740007. 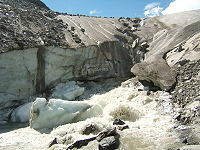 Swisseduc - Glaciers online Extensive website on Glaciers and Glaciology in English and German. 2003-08-15 Scientists Rewrite Laws Of Glacial Erosion. NOVA scienceNOW - A 7 minute video of the NOVA broadcast that aired on PBS, July 26, 2005. Hosted by Robert Krulwich, the video is about the world's fastest glacier and why it is moving too fast. This page was last modified on 23 June 2017, at 15:58.